High quality screw-on fitting with cylindrical threads (1/4 Inch). The hose is fixated and selaed tightly by the union nut, yet it can easily be released with one hand. The fitting can be rotated freely (360°). Ideal for Chipset- or graphics card cooling as well as self-constructions where elbow fittings have advantages. This system ensures maximum safety and ease of installation. 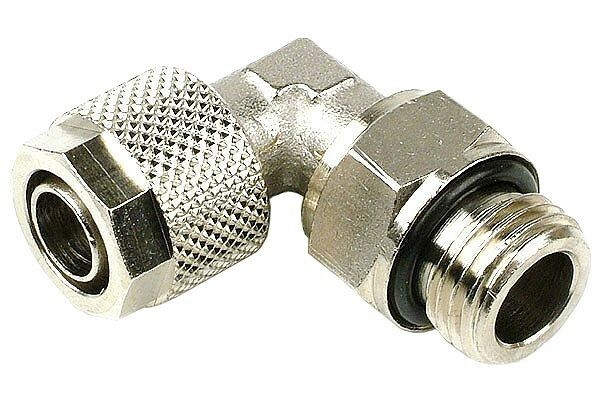 This screw-on fitting is compatible with hoses with an outer diameter of 10mm and 8mm inner diameter as well as G1/4" threads.